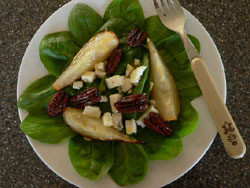 Roasted Pear Spinach Salad on a bed of baby spinach topped with delicious roasted pears, blue cheese, caramelized pecans and then drizzled with Dijon Vinaigrette salad dressing. Don't care for spinach? Substitute the spinach with spring mix salad or put together a blend of salad greens. Preheat the oven to 400°F. 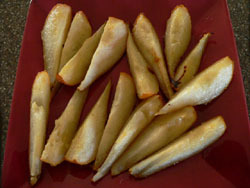 Cut each pear half into 4 wedges and put on parchment-lined baking sheet. Mix together butter, sugar and lemon juice and drizzle over pears. 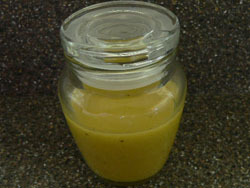 Roast the pears for 20 to 30 minutes, stirring every 10 minutes. Allow the pears to cool to room temperature. Stir sugar, oil, and vinegar in a large skillet over medium heat until sugar melts and syrup bubbles, about 3 minutes. 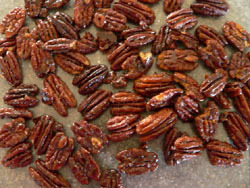 Mix in pecans and stir until nuts are toasted and syrup coats them evenly. Spread the nuts on a parchment-lined baking sheet and roast for 10 minutes at 400°F. Nuts should look like they are glazed. Cool completely on a sheet of wax paper or foil separating with a folk. Put all ingredients into a shaker to blend. Best is made at least one hour before serving.